After 50 years, Brantford-born and Paris-based author N.W. 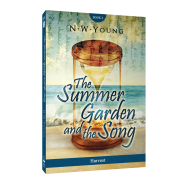 Young (Neil w Young) has finally fulfilled his promise: the final chapter in his epic 2-book love/coming of age story, The Summer Garden and The Song, was released this past Thursday. The Summer Garden and The Song: Harvest concludes the story of Mick Neilson, whom we were introduced to in book one, The Summer Garden and The Song: The Circle of Life, which was released in July 2016. “For the residents of Haddon Junction, who had brought in the New Year with the usual revelry and celebration, there was scant reason to expect 1959 to not come and go pretty much like any other year—with little of any consequence to remember it for. This is a coming of age story; it is a love story—a story of loves gained, loves lost, and loves unconditional. Where The Summer Garden and the Song: The Circle of Life ended, The Summer Garden and the Song: Harvest begins. It is the continuation of the story of Mick Neilson, the Summer Garden, and a song. Both books are available at the Cavern of Dreams Publishing online store and through the author for $19.95; book one is currently available on Amazon and book two will be available there in the next few weeks.